Aisha O’ Connor wrote this post as a project for Stacy Krueger-Hadfield’s Conservation Genetics course at the University of Alabama at Birmingham. She sat in on lectures while she was at UAB as part of a British Phycological Society Student Bursary project. Aisha grew up in Ireland and completed a BSc (HONs) in Marine Science at the National University of Ireland Galway from which she graduated in October 2018. Currently, Aisha is in the middle of a research project looking at the genetic structure of kelp forests in Ireland. 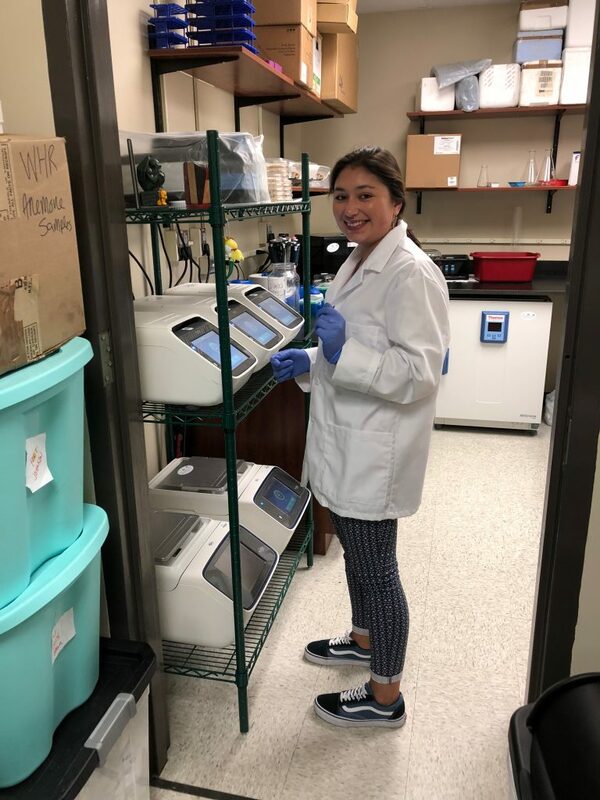 She is hoping to pursue further algal research, is looking into funding opportunities, and is applying to graduate programs. Aisha tweets at @Aisha_MOC. When the opportunity arose to participate in a collaborative research study, with Dr. Stacy Krueger-Hadfield (University of Alabama at Birmingham) and Dr. Kathryn Schoenrock (National University of Ireland Galway), I jumped at the chance to study the population genetic structure of Laminaria hyperboreaforests along the west coast of Ireland. For part of August and September 2018, I was a visiting student in the Krueger-Hadfield Evolutionary Ecology lab dipping my toes into the molecular ecology sea. There has been a longstanding tradition of seaweed harvesting in Ireland. Hand-harvesting was the original method for collecting seaweed, and though it is still being used to the present day, it may soon be made redundant upon the mechanization of harvesting. 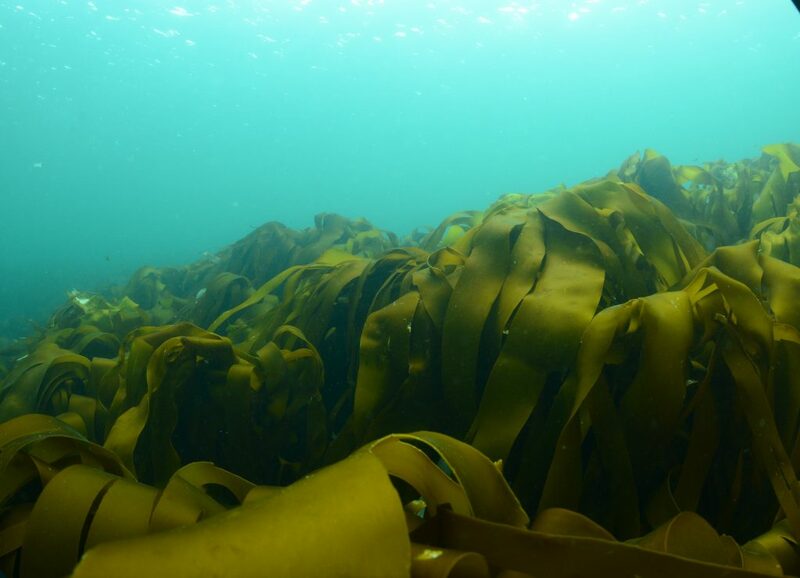 Predominantly harvested on the west coast of Ireland, seaweeds like Ascophyllum nodosum and mäerl, have been exploited for their high alginate content, nutritional benefits, and fertilizing compounds (Werner and Kraan, 2004). The fertilizing properties of brown seaweeds have long been known to enhance the barren soils of Connemara and the Burren, vast limestone dominated areas of Galway and Clare, among other regions of the Wild Atlantic Way. The mechanization and expansion of seaweed harvesting in Ireland appears to be the next logical step forward as the full potential of harvesting in Ireland is not currently being reached. However, there are widespread concerns that this progression will lead to the overexploitation of algal communities and will cause a detrimental impact on the local environment which these algal communities support. Laminaria hyperborea is a kelp (Figure 1), or brown seaweed, that forms extensive forests along the west coast of Ireland and has been harvested in other countries, such as Norway (Werner and Kraan 2004). Kelp forests are known to be sites of great algal and faunal abundance and diversity (Dayton 1985; Durrant et al., 2018). With global climate change looming and the recent interest in kelp harvesting in Ireland, it is critical to understand the unique ecosystem created by L. hyperborea forests before long-term changes occur. An insight into this underwater wonderland may help in the protection and conservation of L. hyperborea and the habitat it creates. Figure 1. Underwater view of a kelp forest at Zetland Pier in Bantry Bay, Ireland. Courtesy of Dr Kathryn Schoenrock. Previous work on L. hyperborea is scarce, particularly in Ireland, meaning this research will provide a baseline for future studies. The lack of available information poses a challenge in effectively studying the organism in question in terms of understanding the full range distribution of L. hyperborea, and, in particular, the genetic structure of this species. In comparison, substantially more work has been performed on other members of the Laminariales, such as Laminaria digitata (Couceiro et al., 2012; Brennan et al., 2014; Robuchonet al., 2014) and Laminaria ochroleuca (Coehlo et al., 2014). When reported, a pattern of isolation by distance (IBD) mostly explains the structuring of kelp populations (Figure 2). Generally, low genetic diversity has been recorded across the Laminariales. The number of alleles per locus varies greatly, between brackish and marine waters, and between populations of kelp from different sites, such as Laminaria digitata from Co. Down, Ireland and Brittany, France (Brennan et al., 2014; Oppliger et al., 2014) and populations of Saccharina latissima from European sites and eastern Maine, USA (Guzinski et al., 2016; Breton et al., 2017). Genetic differentiation is generally considered significant across studied populations, though varying between low and highly significant values (Brennan et al., 2014; Evankow, 2015; Nielsen et al., 2016). Billot et al. (2003) was the one of the first to find scale to be an influencing factor, where genetic differentiation was observed only in L. digitata populations that were >10km apart. Robuchon et al. (2014) found L. hyperborea populations to have higher genetic diversity than L. digitata populations. 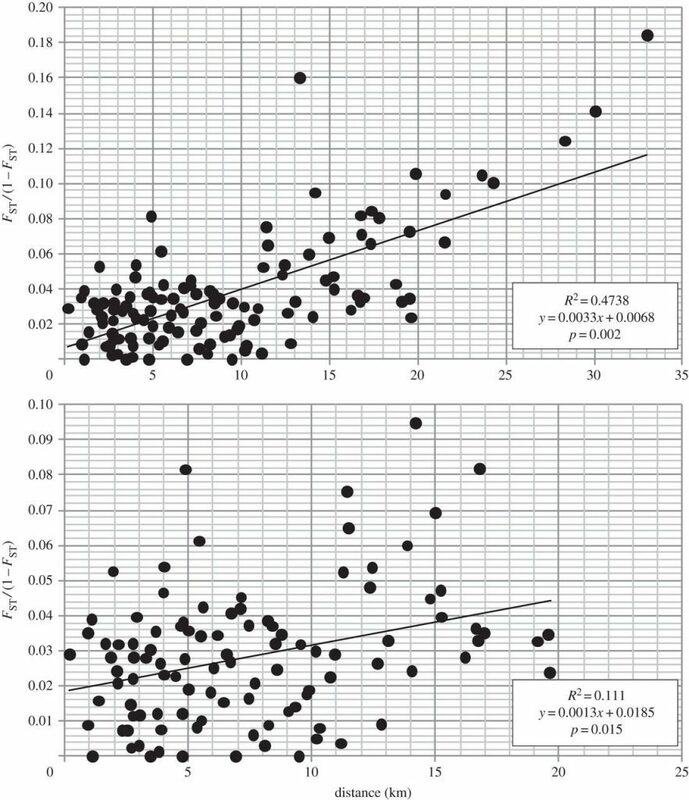 IBD patterns were observed in both species, in which reduced gene flow for both L. digitata and L. hyperboreastudy populations at a scale of 10-15km was observed (Robuchon et al., 2014). Previous work on kelps has provided us with a guide to study L. hyperborea populations along the west coast of Ireland. We have a vague understanding of the distribution of L. hyperborea on Irish coasts, so it is important now that we further our knowledge of our kelp forests and discover patterns of genetic diversity, levels of allelic richness and the structural influence of IBD patterns. In order to achieve this, we must carry out repeated sampling along the western coast of Ireland, from north to south. This will help us map the occurrence of kelp forests combined with the knowledge of where harvesting and cultivation takes place on Irish shores. The preliminary genetic structure shows significant patterns of isolation by distance, meaning this research is of utmost importance in informing us of the resilience of L. hyperborea to harvesting as well as climate change (Schoenrock, O’ Connor, Krueger-Hadfield, in prep). In addition if the findings were to suggest the kelp forests along the west coast of Ireland are genetically distinct from other kelp forests, this may call for the designation of an MPA such as that off the coast of France, the “Parc naturel marin d’Iroise” (Couceiro et al., 2012). This entry was posted in blogging, ecology, evolution, fieldwork, haploid-diploid, natural history, population genetics, Science Communication and tagged Blogging, Kelps, Laminaria, population genetics, Science Communication, seaweed, students. Bookmark the permalink.